Extra virgin olive oil. P.D.O. Chianti Classico. Superior category olive oil obtained directly from olives and solely by mechanical means. Pungent, fruity with a rich aroma and a strong peppery finish. This extra virgin olive oil is a selection of Frantoio, Coreggiolo, Leccino and Moraiolo Cultivar olive varieties. 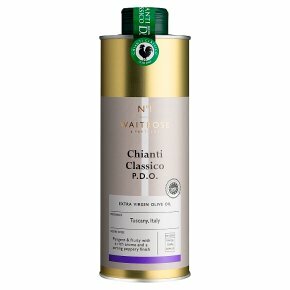 The Chianti Classico zone, in central Tuscany, is famous for its extra virgin olive oil, as well as for its wine. A pungent and fruity olive oil pleasant to the nose with a strong peppery finish.